Description: The school should identify a staff member or volunteer (possibly an interested parent) to facilitate the initiation of the Safe Routes to School Program for the school. Description: The facilitator should reach out to interested persons to begin the formation of an informal SRTS taskforce for the school. The taskforce should include members of the local advisory committee, the New Paltz bike/ped task force, parents, teachers, school administration and local residents. 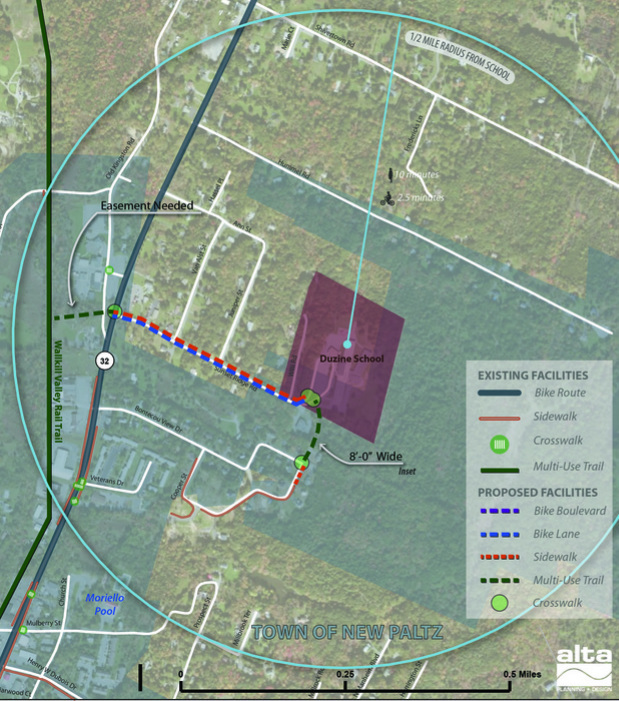 Description: The school, through the SRTS Taskforce, should work with the Village of New Paltz to seek written permission to install a school speed zone on the recommended roadway segments. After this approval is granted, high-visibility fluorescent yellow green signs designating the school zone and school zone speed should be installed. Police enforcement and temporary radar trailers can also be used to promote and enforce the new speed limit. Description: Construct the paved shared use path between the Duzine Elementary School and Cooper Street. This will provide a safer walking and bicycling route between the neighborhood and the school. High visibility crosswalks should be installed at key crossing points at the school at the same time. Description: Implement the proposed site improvements with the current redevelopment plan of the Middle School campus. This includes the site circulation improvements, new sidewalk connection to Main Street, and raised crosswalk. 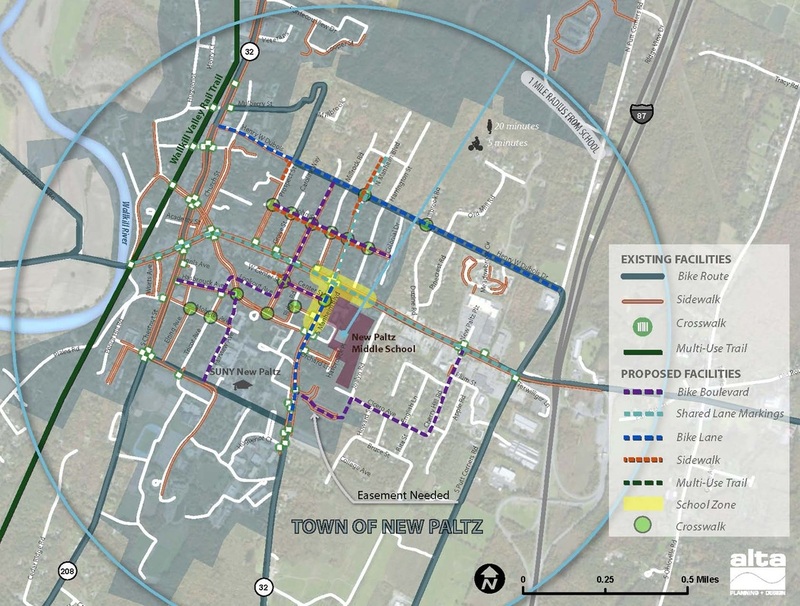 Description: Install crosswalks and complete sidewalk gaps at proposed locations immediately adjacent to the New Paltz Middle School along Center Street and John Street. Crosswalks that link existing sidewalks should be prioritized, with new crosswalks being installed with other proposed infrastructure, like new sidewalks and bike boulevards. 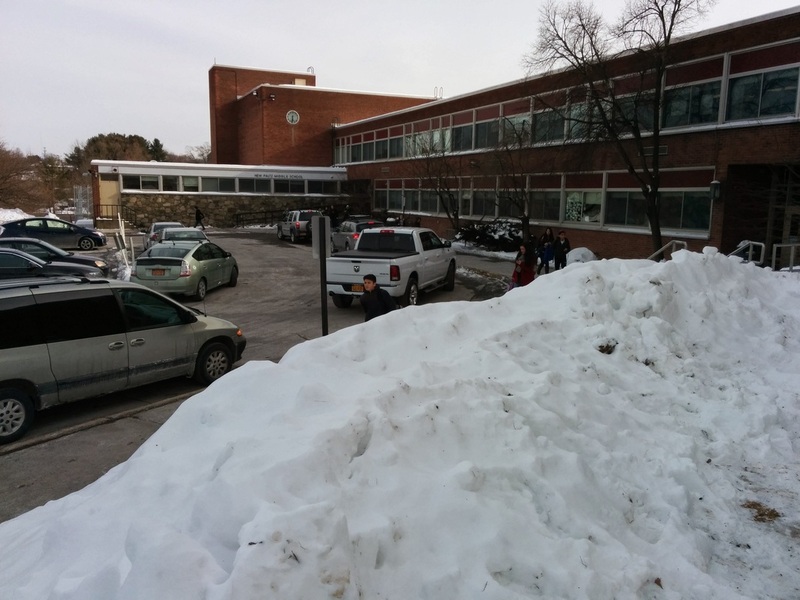 Description: Install bike racks at both the Duzine Elementary and New Paltz Middle School. The bike racks should be placed near the entrance to the school with good visibility for both awareness and security. If possible, these bike racks should be covered to protect bicycles from the elements. Description: Install bike lanes on S. Manheim Blvd and shared lane markings on N. Manheim Blvd to provide an immediate bicycle connection to the school.